New School Counselor | Gatewood Schools, Inc.
We would like to welcome our new School Counselor, Brittany Collis, to the Gatewood family. 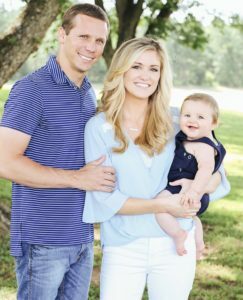 Brittany is from White Plains, Georgia and graduated from Nathanael Greene Academy in 2008. She received a Bachelor’s in Psychology from Liberty University and a Master’s in School Counseling. For the last three years, she has worked for Oconee County Schools as the Elementary School Counselor. She is married to David Collis from Eatonton, and they have one son named Anderson who is seven months old. As a School Counselor, her primary responsibility is to promote the academic, personal, and social development of all students. She will be working with students individually, in groups, and teaching lessons in the elementary classrooms once a month. This year she will be assisting Mr. Deloach and helping students/parents with the college process. She will be in her office Monday, Wednesday, and Friday or available by email at bcollis@gatewoodschool.com. We look forward to having Brittany offer support to our students, staff, families, and community.